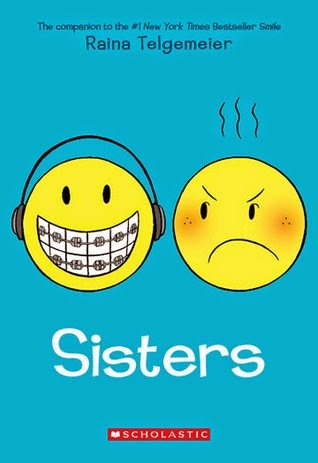 Today is the day my sixth graders have been awaiting: the release of Sisters, the release of Raina Telgemeier's smash graphic novel, Smile. That was the most widely read book in my classes this year, and they are lining up to find out what happens next in Raina's childhood. Set during a road trip from California to Colorado, Sisters steps away from the drama of school and into the family tensions that come from being in a confined space. Most of the tension is between Raina and her nine-year-old sister, Amara. They argue about their differences, such as Amara's love of snakes, as well as their similarities (the colored pencils Raina refuses to share). While most readers will be able to relate to the sibling rivalry, what caught my attention was how difficult parenting is. I would lose my mind if I had to spend a stormy road trip disciplining squabbling kids. There was less plot to this book than its successor, but I know that won't matter to my students. In their eyes, anything Telegemeier touches turns to gold. The end of the book features photos of the sisters in situations from the novel. This makes me wonder if Telgemeier will continue telling the story of her life through graphic novels. I know hundreds of adolescents with their fingers crossed for that.